Bed bugs likely get their name from their habit of feeding on humans while they sleep in their beds. They are found in virtually every place people tend to gather, including residences, hotels, schools, offices, retail stores and even public transportation. If you do identify bed bugs in your home, contact Scorpion Pest Control Services promptly. They will be able to inspect your home, confirm the species and recommend a course of bed bug treatment. Bedbug (Cimex hemipterus) Adults are 4-5 mm long, wingless, rounded, flat and reddish-brown. New hatched nymphs are translucent; nymphs resemble the adults and grow through 5 moults before reaching maturity. Eggs (up to 350), 0.8-1.3mm long, ink-bulb-shaped, laid in cracks and crevices near host and cemented in place by glue; 5 nymphal stages lasting up to 50 days; adults can live for more than 1 year without feeding. Bedbugs are pests that thrive around human dwellings. They live only on human blood for survival. They have received their name from it's close association with human bedding. 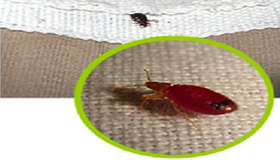 Bed bugs are very common in public transport, hospitals, theatres, hotels, hostels etc. They move from place to place along with peoples clothing and baggage. 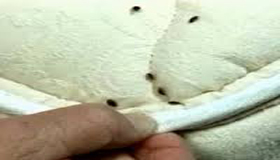 During day time bed bugs hide in tiny cracks and crevices and feed on blood at night. Since they are mostly found in beds they are named as Bed Bugs. With our expertise in controlling bedbugs; we analysis and identifies the cause for the pest attack and provides solution for the cause. Our service consists of thorough inspection of the entire premises especially the places where people have extended period of contact. These places are beds, mattresses, pillows, linen storage compartments, sofa chairs, walls etc. 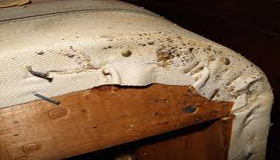 In Bed bugs pest control a thorough insecticidal spray is given to all cracks and crevices in furniture, bed joints and other fixtures, special attention is given to mattress beading and folds, where a light spray is delivered. Since, bedbug eggs are resistant to insecticide penetration, the second bed bug management treatment is followed up after 15 to 20 days to control new hatchlings. We tend to provide effective and systematic pest control service across Bangladesh. We offer bed bugs control for house, office, hotels, hospitals, theaters, public transport. 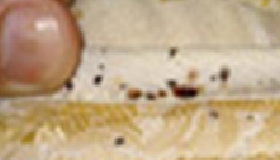 Adult bedbugs are 5mm long. The female bed bugs lay anywhere from 200 to 500 eggs in their entire life span. 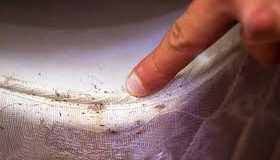 Bed bugs do not have wings, but can crawl relatively fast. 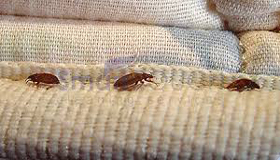 Bed bug infestation will also be associated with an unpleasant odor. Bed bugs can thrive almost every where. This makes it very difficult to find them too. If you are having a severe bed bugs problem in your home or office they could be just about anywhere. In between the books, the furniture, the bed linen, the office files or on you in person, any little crack or crevice they can be anywhere and everywhere. In addition to being a terrible nuisance, they can cause you a lot of embarrassment. They can be a real nuisance. Bed bugs can also be the cause for severe skin reactions. Babies and those with soft sensitive skin are the worse affected. Blood spotting on bedding, mattress, base, as well as walls and furniture. Live Bed Bugs (Adults & Nymphs) hidden in mattress seams folds bed bass etc. Skin welts and irritation caused by the bites. Shed Bed Bug skins and faeces in harborage areas. Bed Bug eggs in and around adults and nymphs. The most commonly affected areas of the body are the arms and shoulders. Reactions to the bites may be delayed; up to 9 days before lesions appear. Common allergic reactions include the development of large wheals, often >1cm, which are accompanied by itching and inflammation. How to Get Rid & Kill of Bed Bugs? Allow the experts to take care of the situation. Before you resort to getting rid of your bed , please give us a call. 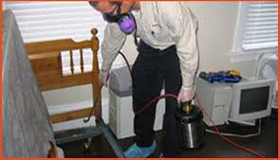 We are trained to handle even the most severe of infestations. Our experts are trained to evaluate the situation and prescribe the most appropriate pest control methods. We provide highly effective chemical spray treatment that would take less than 2 hours to complete. The special insecticides that we use are prepared to deal effectively with the worst of problems. How do we do the treatment? We will thoroughly spray and almost drench the beds and bed sheets to kill all hidden bed bugs. Kindly dry the beds in the sun to dry the wetness. We will spray the wardrobe, walls and wherever the infestation is found. The time taken for treatment will be an hour for residence or office premsises. The results will be achieved within 3 - 4 days. Control of bed bugs requires the cooperation of the building owner or premises manager, working along side the Reddy’s pest control technician. If an person suspects a bed bug infestation they should first ensure there is no chance of spreading the problem from room to room. Bed bugs are great hitchhikers, so do not spread the infestation by moving bedding, furniture etc from one room to another. In extreme cases it may be necessary to isolate all equipment and materials that come into contact with the infected room. Even minor infestations from a chance transfer can become a major problem. The essential first step in Bed Bug management is pest identification and determining the extent and level of infestation. Site inspection is crucial. 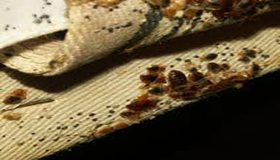 When this is known the Reddy’s pest control technician can assess the treatment options and time needed for treatment. After inspection and before treatment, a wash down of surfaces affected with blood spotting not only improves the appearance but also allows a follow up inspection to be done with greater confidence. In extreme cases it may be better to discard the mattress - burning or tipping is recommended, again ensuring that other items do not become infested. Care must be taken when moving affected items, sealing them in plastic bags before they leave the room is recommended. Bed linen should be washed in hot water followed by a hot drier. Sensitive materials can be placed in a freezer allowing enough time for the entire volume of the item to reach the temperature of the freezer. 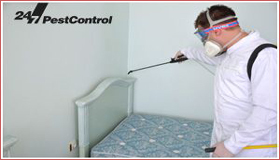 Treatment involves the direct use of registered pesticide to harbourages such as mattress, base, slats, carpet edges, tack board below carpet , cracks & crevices, wardrobes and cupboards. The premises would then need to be treated for 3 times (Monthly once) until the infestation dead. Reapplication would be necessary if live bedbugs were found in the premises. What You Should Do At the Time of Treatment and before? Keep safe the prepared food items. Please engage your kids below 5 Years outside for 2-3 hours. You can re-arrange the items (if any items moved) back after 3 to 4 hours. create stain on the wall. If needed dry the mattress in the hot sun after 2-3 hours of treatment. It would be best to call in experts rather than trying to do it yourself. Doing it yourself can be a health or safety threat. The health and safety of your family is definitely your primary concern. We are just a call away at 01711-520720, 01711-536093. We will be with you all the way.